It’s not uncommon for Emory Radiology’s renowned faculty to be welcomed as visiting scholars by top academic health centers. It is uncommon, however, for a country’s top government health official to issue the invitation, which makes Dr. Sherif Nour’s recent visit to Egypt all the more exciting. Egypt’s Assistant Minister of Health, on behalf of the Minister, invited Dr. Nour, associate professor and director of Emory’s Interventional MRI program, to lecture on and perform image-guided percutaneous liver tumor ablation. Dr. Nour gladly accepted. The four-day trip began in Cairo with Dr. Nour delivering six hours of didactic lectures on image-guided procedures. Sixty-two physicians from all over Egypt attended. 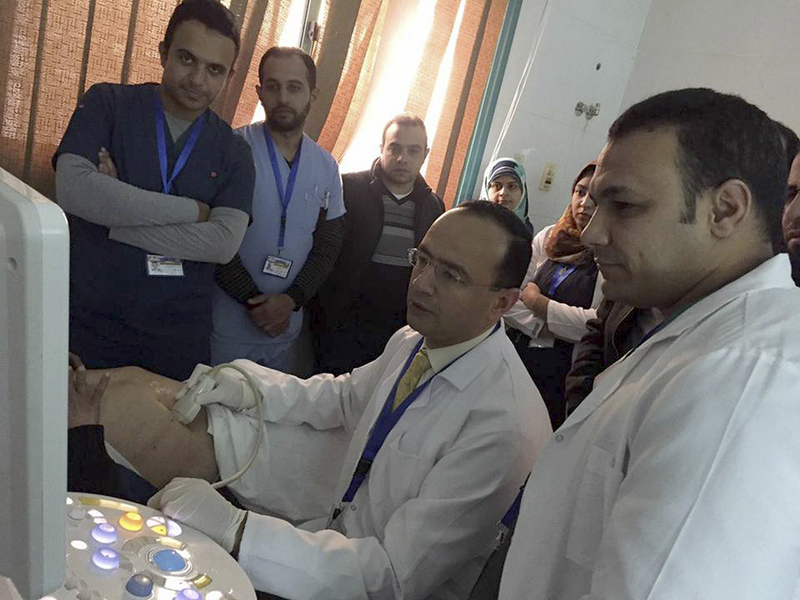 Dr. Nour and many of those physicians then traveled to Ismailia, a small, medically underserved town near the Suez Canal east of Cairo, for a three-day training course in percutaneous liver tumor ablation. Dr. Nour worked in Ismailia Oncology Teaching Hospital, a small facility serving many. Advertisements in the newspaper touted Dr. Nour’s visit and urged patients in the area with liver cancer to come to the hospital for screening. Dr. Nour and his team screened 21 patients the first day, using ultrasound to identify patients who could benefit from image-guided tumor ablation. “If we catch the tumor at a certain size, we can perform percutaneous ablation and eradicate the liver cancer,” says Dr. Nour. Over the next two days Dr. Nour performed tumor ablation for eight patients. An early career radiologist joined five other doctors in the operating room to observe the first six procedures; Dr. Nour coached the trainee through performing the last two procedures. A live broadcast into a nearby conference room allowed dozens of other physicians to observe and ask Dr. Nour questions during the procedures. Dr. Nour also provided guidance on how to take care of patients before, during, and after image-guided interventional procedures. The high impact visit made headlines in Egypt. 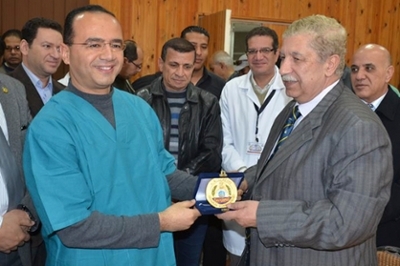 The governor and senator from the Ismailia governate visited the hospital and presented Dr. Nour with a plaque of appreciation. The visit proved so successful, Dr. Nour has a standing invitation to return and provide additional training. In the meantime, Dr. Nour will provide telemedicine consults for difficult cases. The trip was a coming home of sorts. Dr. Nour completed his own medical training in Cairo—medical school at the Cairo University School of Medicine and internship and residency at Cairo University Hospitals. His parents still live in Cairo, so he was able to visit with them after his official duties concluded.